Oil on panel 70 x 67cm; signed 'Rob. Boudry’s interests in the technical difficulties of painting multiple reflective surfaces and in the internal colour harmonies of a picture are worked out here in a composition which is simultaneously packed to the point of busyness, and extremely tranquil. 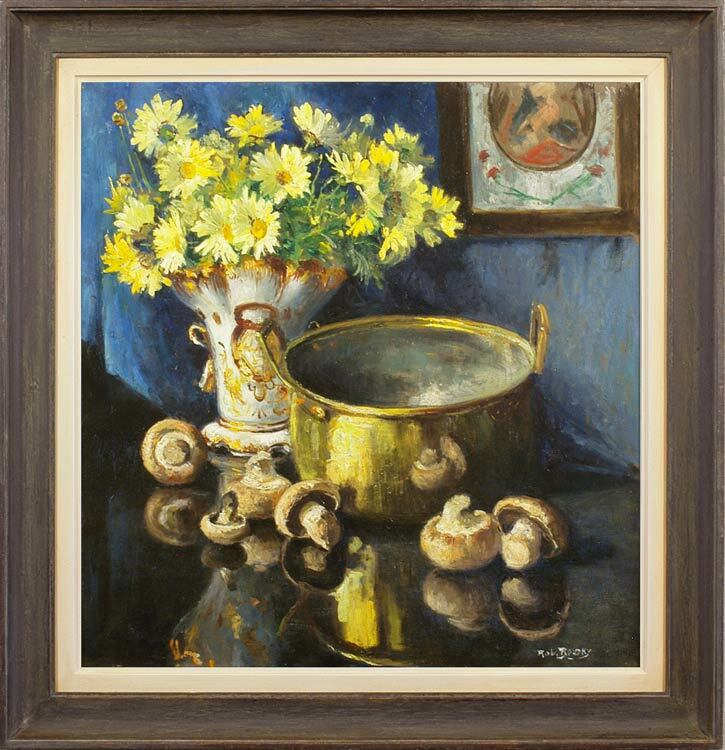 He seems particularly attracted to the form and softly mirrored substance of the preserving pan, which he has painted before; it becomes a foil to the matt, organic colours of the flowers, and reflects with an interesting slight loss of clarity the mushrooms, which are also reflected more clearly in the polished table. His sense of colour is as sensitive and pervasive as in all his paintings; here, employed in a harmony of cool greys and yellows, which reflect the primrose shades of the daisies, and the blues of the background and reflected porcelain. He may have been influenced by the work of the British Aesthetic artist, Albert Moore, friend and mentor of Whistler. Robert L.P. Boudry (1878-1961) was born in Ypres, the son of Aloïs Boudry, a painter of genre scenes. His father had studied at the Academies of Ieper and Antwerp, won various medals in his career, and been honourably mentioned in the Paris Exposition Universelle of 1889; he was known in Belgium for his paintings of fishermen, but after fleeing the 1914 German invasion, he worked in Britain as a portraitist. Robert Boudry seems to have remained and worked mainly in and around Antwerp; like his father and his son, he went to the Antwerp Académie des Beaux-Arts, where he was taught by Eugène Joors and P.F. Verhaert. He produced still life and landscape paintings, and also very accomplished etchings. The landscapes are steeped in sunshine and manufactured of pure colour, so that although they are realistic views, portraying local agriculture and coastal industries, they also tend toward the expressionistic and symbolic and teeter on the brink of Fauvism. His son Paul Boudry (1913-76) became an artist: a painter of flowerpieces in the style of 17th century Flemish works, for the details of which he used brushes with a single hair.